Red cotton hi-top logo sneakers from Prada featuring a round toe, a lace-up front fastening, a contrasting toe cap, a ridged rubber sole, a leather lining and a triangular Prada patch to the side. 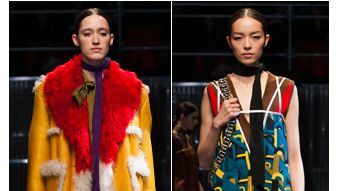 See our top 10 favorite looks from the Prada fall/winter 2014 show at Milan Fashion Week. low top logo sneakers from Prada.